Named one of the best steakhouses in the Fort Worth/Dallas area, Hunter Brothers' H3 Ranch, Live Hickory Wood Grill offers a wide variety of steaks, rainbow trout, lip-smackin' ribs, chicken, spit-roasted pig and much more - all served with a smile in comfortable, casually upscale surroundings. 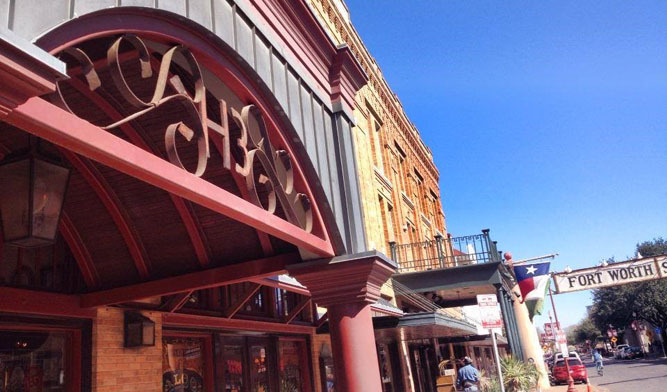 Located at the corners of Main and Exchange streets in the heart of Ft. Worth's Historic Stockyards District, H3 Ranch serves lunch and dinner every day and breakfast on the weekends. Spit-roasted pig, delicious steaks, prime rib and tasty ribs (served with H3's famous Lip Smackin' Sauce) keep folks coming back again and again. Tastefully casual, fun western atmosphere and FREE VALET PARKING make each visit a pleasure. Whether it's a business lunch or a big birthday celebration, H3's friendly staff is ready to make your H3 Ranch experience a special one. Come inside and take the H3 tour and try a Taste of Texas!